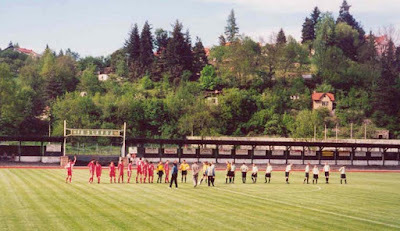 To get myself in the mood for my first experiences of the European cup competitions which should occur in the next few weeks, I've been reflecting on my only 2 experiences of watching football out in Europe itself and as pre-digicam pictures occur of both I thought I'd share them. The plan on my Czech Republic trip 3 years ago had been to watch Sparta Prague play at home but the timing of our trip to the south of the country, and a late shift in the league fixtures, put paid to that. Although, once I'd bought a ticket for a 'black light theatre' performance the following Monday afternoon, I then discovered the Czech Cup Final was being played at the national Strahov stadium in Prague. The following Monday afternoon. Couldn't really dip out on my mate, so I resigned myself to no fitba on the trip. However, while we were knocking about the picturesque town of Český Krumlov, a solitary forlorn looking poster, the kind of generic 'space vs space' thing where the teams get written in crudely with marker pen afterward, was spotted hanging on a town notice board amongst the propaganda for an upcoming local election. Needless to say the location of the ground was instantly rekkied for ease of approach the following day, when the fixture was to occur. Once there it wasn't exactly obvious of how to get in the ground in the proper manner, but there were plenty of places where we could have easily snuck in for nowt. Not wanting to incur any wrath, we eventually found a bridge-like structure next to what seemed to be the changing rooms (possibly a clubhouse) and the pitch. A gentleman, possibly approaching retirement, stood on the other side of the bridge next to a table adorned with a plastic punnet filled with change, and some elementary programmes (1 sheet of A4 folded to A5). By throwing a decent wedge at him, and counting our change, we worked out that the entrance fee was 60Kc (roughly 20p at that time if I recall correctly), but did not realise that the programmes were free. As such I went back later to ask for one in the English tradition of pointing, raising my eyebrows and smiling awkwardly. What matter that I couldn't understand a word of said programme. 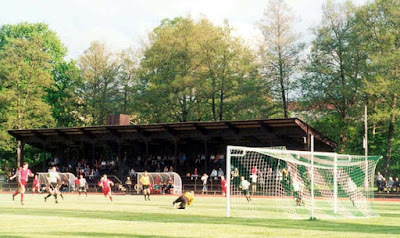 Possibly the best aspect of the game (considering these were my pre-teetotal days) was that a small beer hut was available towards one corner of the ground, with picnic tables and such (as seen in the picture below) where not insubstantial glasses of strong Czech lager were on sale for the equivalent of 30p. Come the final whistle, it's fair to say we were steamin'. This brought its own problems though during the course of the game as it wasn't entirely clear where the gents were. They may well have been in the building over the bridge, but being strange foreigners (I don't expect they get many) not over experienced in the lingo save for 'dva pivo prosim' (which we'd given ourselves plenty of chance to practice during the course of the game), we didn't want to risk wandering into forbidden territory. As such we delivered to the club several examples of another fine English tradition in the shape of our long arcs of urine splashing regularly against the back of the stand. The freshness of the stains nearby suggested though that we weren't the first. Being well juiced was probably for the best as it did seem like typical end of season fare, although in a country where football corruption and attempts at match-fixing are rife, this game certainly came across as pretty clean. That said, when the home side scored, there was barely a whimper from the stand. I think I was more excited, but the local elixir can possibly be blamed for that. I'm not exactly sure of where this clash figured in the Czech football system, which appears to be less of a pyramid and more of a straight line with a load of regional leagues at the bottom (which don't necessarilly feed up), of which this is one. From the standard of play and numbers in the approximate crowd though you could probably equate it to levels 8 or 9 in the UK, between the county leagues and the bottom rungs of the Southern, Northern and Isthmian. Certainly though it was enjoyable for the fact that it was a bit of a find and an unexpected one, that it was lower league, and that the ground, whilst certainly spartan with its facilities, was placed in a kind of small valley, little houses dotted around the face of the hill climbing up opposite the stand. 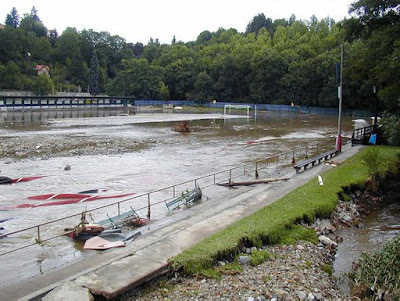 At least the folks in them would have been safe from the floods that swept through Europe including Prague and Český Krumlov just three months after out visit. The picture below shows the affect to the football ground, but I'm happy to report that the club seem to still be in action there, they certainly were last season according to my investigations, but whether the stand survived, I don't know. Apologies for the 'what I did on my holidays' nature of this write-up, but it were a long time ago, so I've forgotten the minutae, and this is just an excuse to publish the photos really. This sojourn was manna from heaven for an old footy soak like meself, but spare a thought for my travelling companion. I doubt many Englishmen can claim that their first EVER experience of live football was in, roughly, the 8th rung of the Czech semi-pro ladder. I still remember that bloke who seemed to get hacked down a couple of time but just carried on regardless and think he scored. Amazing what loons pop up on here!! He knows cos 'e was there, as Max Boyce might have put it. Latvia this year chum, you know it makes sense. 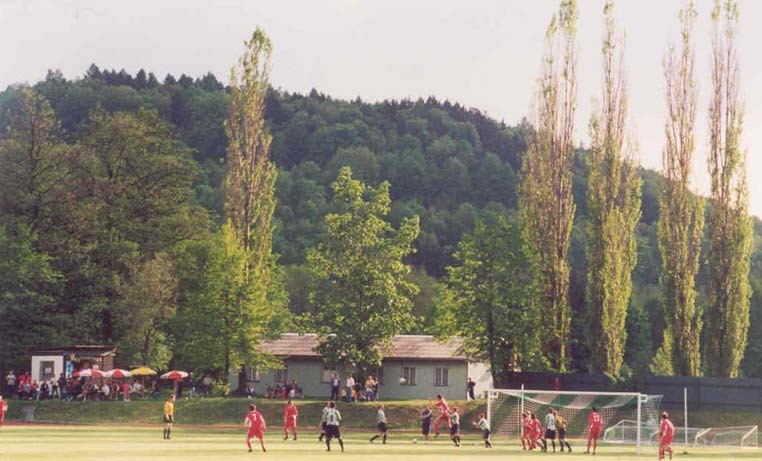 Český Krumlov finished runners-up and Olešník were relegated.